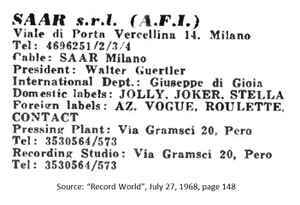 Affiliated: SAAR S.p.A. and Saar Records & Tapes and the publishing company SAAR Edizioni Musicali. SAAR stands for Società Articoli Acustici Riprodotti. In December 1960 corporate changes occur and all activities converges under one name, Saar Srl. In early 60's Gürtler opened in Pero, Italy an independent record production center; made of offices, recording studio, computer center and a system for the printing of vinyl and cassette tapes; which employed over 100 persons. A decade later were opened warehouses to Corsico. In 80's began dismantling of Pero factory. The offices, graphic design and mastering room came to Vercellina.